Hans Brinker Hostel Amsterdam, Amsterdam, Holandia : Rezerwuj teraz! Are you looking for an interesting stay in Amsterdam? The Hans Brinker Hostel is your place to go. We are famous for what we don’t offer, instead for what we do. We have no bellboys, no swimming pool, no sauna, no minibars, no room service, no televisions, no airco. No luxury. So why would you come to us? Because we offer a great atmosphere, cheap beds, basic accommodation, free breakfast and lots of fun in the centre of Amsterdam! You can find us at the Kerkstraat, a cozy street in Amsterdam just around the corner of the lively Leidseplein (the hotspot of Amsterdam’s nightlife). We’re also located at a five-minute walk from the Museumplein (where many musea are situated) and the Vondelpark (best place to relax in summer). You can find many bars, restaurants and clubs around our hostel, so you’ll never have to walk far or catch a taxi! But you don’t need to get out of the Hans Brinker Hostel to have a good time. We have a big, funky-designed bar with a happy hour from 5-6pm and a restaurant that serves fresh but cheap meals (around €6,-). In both areas you can use our free Wifi. After spending a fun evening at our bar, you can go downstairs to our underground club, which stays open till 3 or 4 o’clock in the morning. About the rooms: we have private rooms as well as dorms. The beds in the dorms differ from 4 up to 8 beds in one room. Our rooms are basic but provide the necessary. There are lockers for each person to stuff your personal belongings; for valuables we rent safes downstairs. Each bedroom has its own bathroom including toilet and shower. The quality of the showers are questionable, but they do work. A stay with us includes free breakfast, a (small) towel, linen and free wifi. There are smoking areas inside and outside the hostel; smoking isn’t allowed in the rooms. Our reception is open 24hours a day. To make the most out of your stay in Amsterdam, we provide tickets for many activities & attractions, like the Heineken Experience, a free walking tour, boat tours and a pub crawl. We also provide practical tickets: you can get your public transport tickets with us and hop right on a tram. Tram stops are at three-minute walking distance from the hostel and the trams lead you straight to the Central Station. Coming from the Central Station take tram line 2, 11 or 12 to the hostel; hop off after approximately 10 minutes, at tram stop Keizersgracht. In short: we’re a good money-for-value hostel. 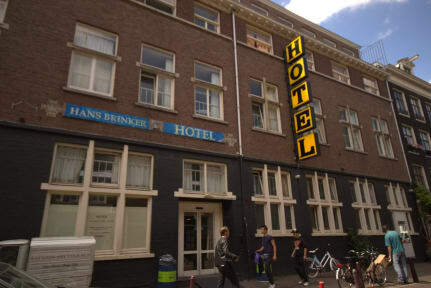 If you want to have a fun time in Amsterdam and only use your bed to have a (short) night sleep and meet many people, this is the place for you! If you want to sleep a lot, maybe not so much. Please read our Things To Note below before booking. For dorms, there's a maximum age of 35. Children under 15 are not allowed. Check-in time during week days: 1 pm. Check-in time during weekends: 2 pm.